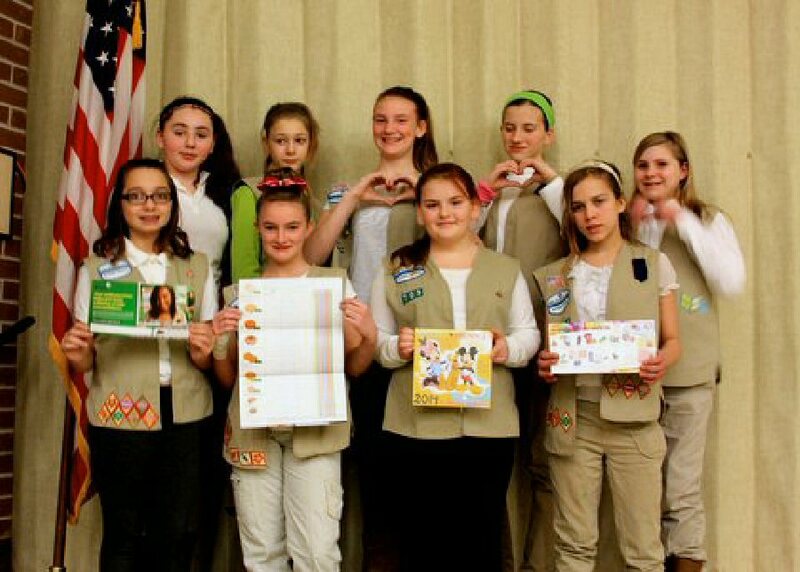 FULTON, NY – The annual Girl Scout Cookie sales week starts Saturday and the girls of Troop 101 are ready to take orders for all the favorites: Do-si-does, Dulece de Leche, Samoas, Savannah Smiles, Tagalongs, Thank U Berry Munch, and of course Thin Mints and Trefoils. Troop 101 will be on hand at Wal-Mart in Granby throughout the day Saturday and also on “walk about” during the week taking cookie orders. The girls of Troop 101 display cookie love and the familiar cookie order forms during their meeting Thursday at Volney Elementary School. They have been saving their money for two years and hope to reach sales of 5,000 boxes this year to push them over the goal line. Cookie Week begins Feb. 1 and ends Feb. 7. Delivery of the delightful cookie boxes begin March 13. Anyone who buys cookies through the Wal-Mart sale would be able to pick them up at the store March 13, 20, or 27 when the girls will be staffing their delivery table from 5 – 8 p.m.